Are you finding that in today’s digital world it is harder than ever to keep stakeholders up-to-date during change? You’re not alone! Even experienced programme directors can feel overwhelmed by the politics above them and resistance from below during times of major change. Let me help! I’m Jo Ann Sweeney and I help change teams win the support of their sponsors, senior executives and end users. 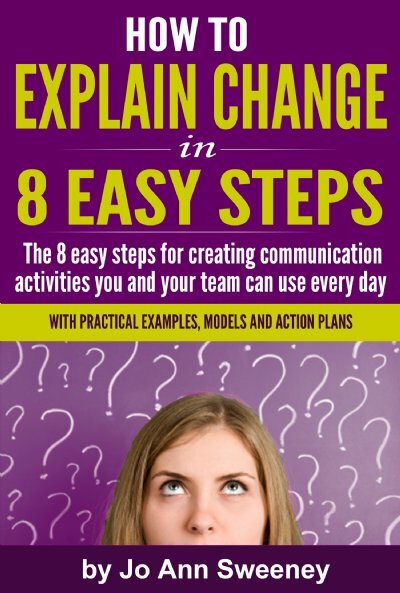 The first step is to download a complimentary copy of my guide How to Explain Change Progammes in 8 Easy Steps. In this guide you will uncover how to create a schedule of communication activities tailored to your stakeholders that you and your team can use every day. It will be easy to use, easy to explain and clearly linked to your programme’s aims. Simply complete the form opposite and your guide will immediately follow. You will also receive my Transforming Tuesdays email with one practical tip each week for keeping people informed about change.